Vibrant, enormous and exciting. 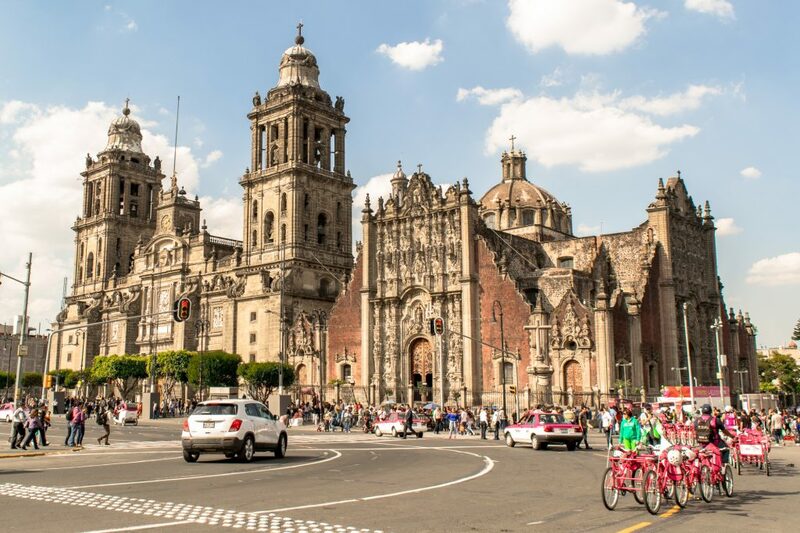 Mexico City boasts numerous historical sites, delicious traditional food, and endless things to do. The capital city of Mexico is easy to access and incredibly affordable. There are many things to do in Mexico City, but above all, it’s a city of surprises. While it’s known worldwide for its enormous urban sprawl and troubles with pollution, what often gets left out of the story are the city’s lovely parks, friendly people, easy-to-use metro system, and quirky highlights – like being home to the only castle in North America that ever housed actual sovereigns. 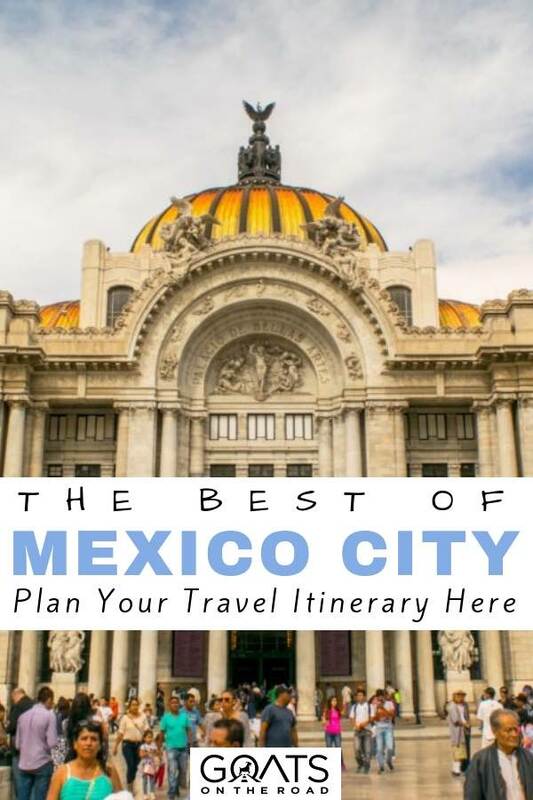 There are many places to visit in Mexico, with Mexico City being a top choice. Here are 23 exciting things to do in Mexico City that you won’t want to miss. There’s no better place to start a trip to Mexico City than in the Zocalo, the city’s main square and the heart of the Centro Historico neighborhood. What you find in the Zocalo will depend on the season. When we visited in December, we were greeted with a giant Christmas tree and an ice skating rink, but regardless of when you go, you’re guaranteed to find the Zocalo teeming with people. 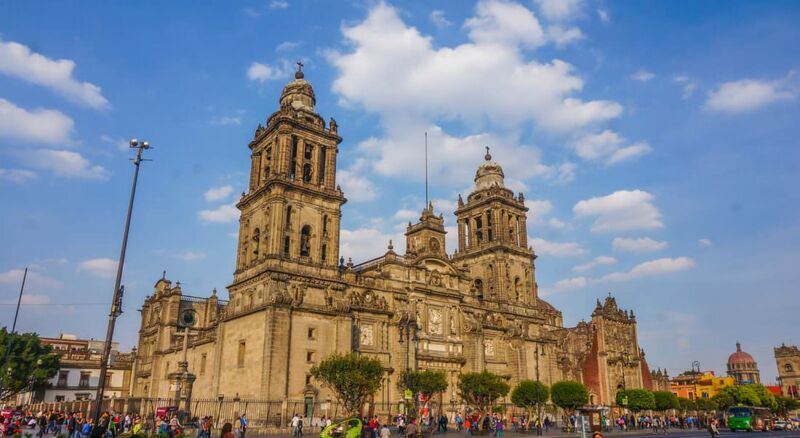 One of the first things you’ll notice in the Zocalo is the Metropolitan Cathedral, which dominates the square and immediately draws the eye. Opulent on the outside and gilded in gold on the inside, the Metropolitan Cathedral is (unsurprisingly) reminiscent of the cathedrals in Spain. Going inside is definitely a must, and if your Spanish is strong enough to listen to a tour in the language, definitely consider taking a rooftop tour of the cathedral. The tour will allow you not only to admire the beautiful rooftops, but to see the Zocalo from above. The cathedral is open from 8am – 8pm, and is free to enter. There is a small additional charge to visit the rooftop. A visit here is one of the top things to do in Mexico City. Everyone knows about Teotihuacan (and you should definitely add it to your list of things to do in Mexico City! ), but you don’t need to head outside the city center to admire Aztec ruins. What we now call Mexico City was once called Tenochtitlan by the Aztecs, and like the modern Mexico City, Tenochtitlan was the capital city and the center of their society. Templo Mayor was destroyed by the Spanish in order to make room for the Metropolitan Cathedral that now sits next door to the ruins. It was a central religious point for Aztec society and made up of two temples that sat side-by-side. Today, it’s fascinating to walk among the ruins of the Aztec temples, especially as you can see the passage of time by looking up at the Metropolitan Cathedral and hear the hustle and bustle of modern Mexico City beyond the complex walls. Templo Mayor is open from 9am – 6pm every day except Mondays, and costs 70 pesos ($3.75) to enter. The seat of Mexico City’s government has sat on the site of the National Palace dating back to the Aztecs. In fact, much of the modern palace is built from materials that were previously part of the former palace used by Moctezuma II. Dramatic history aside, there’s another reason to visit the National Palace while you’re in Mexico City. The palace houses several murals by famous artist Diego Rivera that depict the history of Mexico in vivid detail. The National Palace is free to enter and is open from 9am – 5pm, every day except Monday. When travelling to Mexico, you won’t want to miss the ancient city of Teotihuacan, which is best known in the English-speaking world by the nickname that the Aztecs gave it: The City of the Gods. Carefully laid out, mysterious to behold, and dotted with several pyramids, Teotihuacan is not to be left out on any list of things to do in Mexico City. 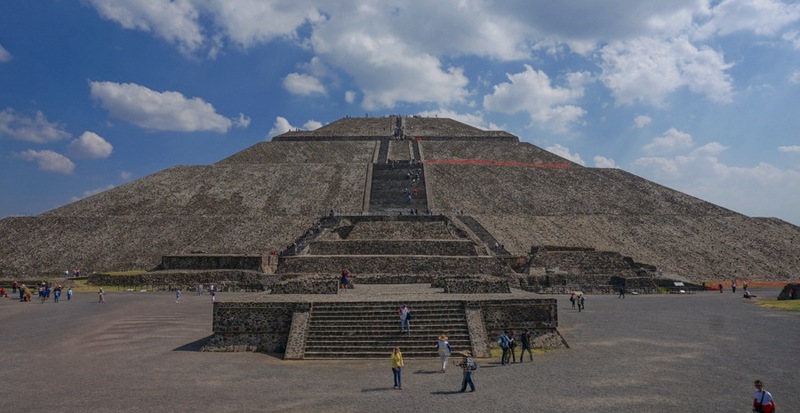 Visit to admire the archaeological history, to marvel at the architecture, or simply to climb a pyramid (the Pyramid of the Sun and Pyramid of the Moon can both be climbed, though prepare yourself for the heat and challenge!). 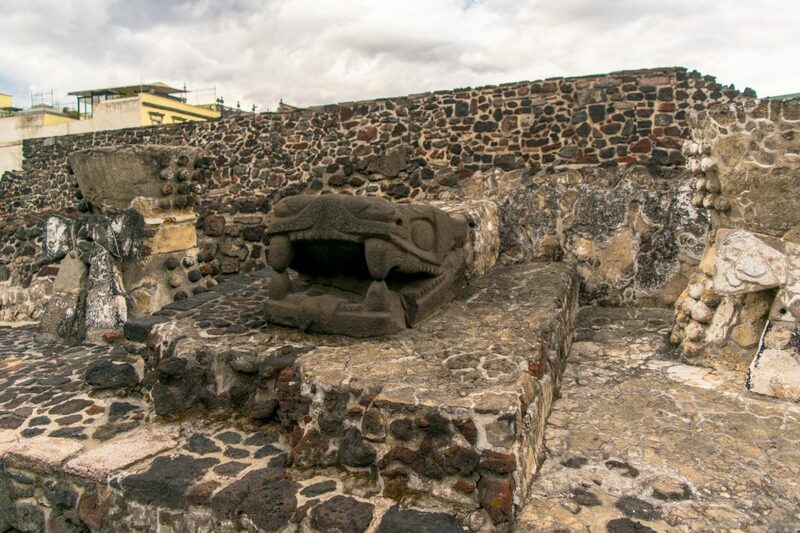 My favorite part of Teotihuacan is a piece of its history – or rather, a missing piece of its history. Though today we associate the city with the Aztecs, it was built a full thousand years before the Aztecs ever got their hands on it. As for who built it in the first place… well, that remains a mystery. Teotihuacan is easily reached via buses leaving from the Autobuses del Norte station in Mexico City. The bus ride takes about an hour each way. The complex is open every day from 9am – 5pm, and costs 70 pesos ($3.75) to enter. Or, join a tour which includes transport, entrance fee and a guide. A visit here is easily one of the top things to do in Mexico as a whole. 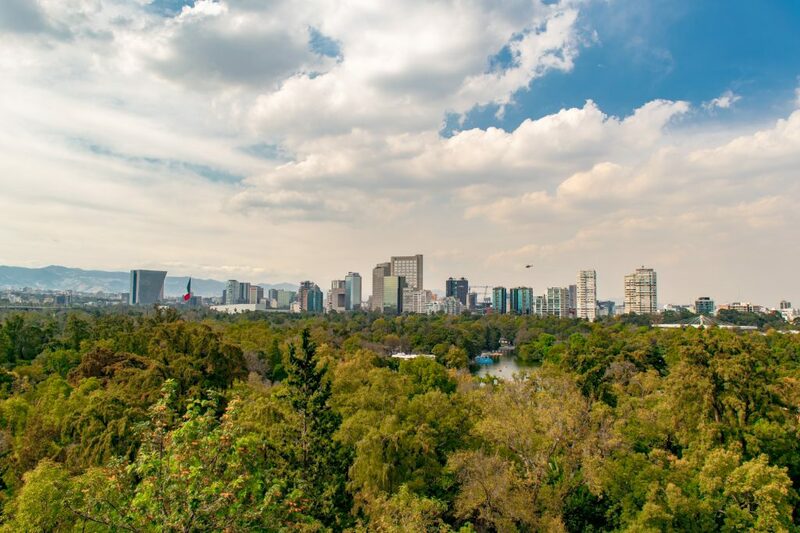 Covering nearly 1700 acres and housing everything from museums to a castle to the world’s friendliest squirrels, Chapultepec Park is a shady, green oasis that is the perfect spot to retreat from the densely populated urban areas that surround it in Mexico City. 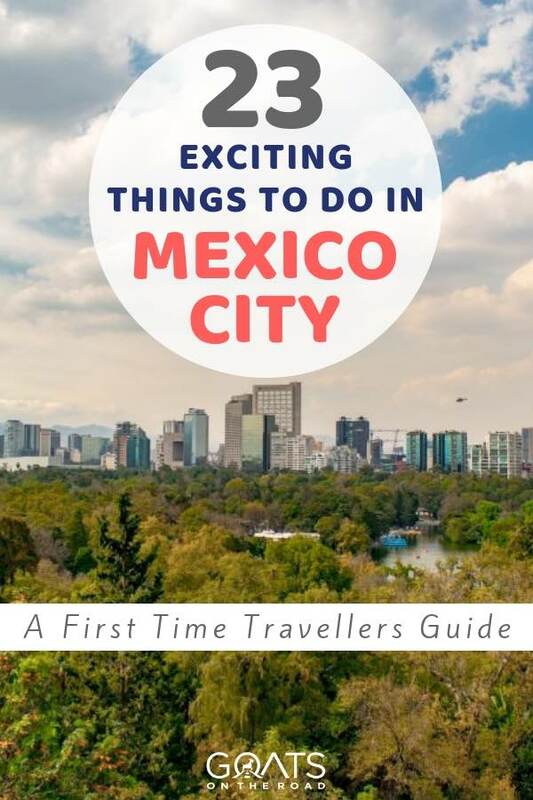 Many popular sights and things to do in Mexico City are located inside the giant park, including Chapultepec Castle and the Anthropology Museum. Located inside Chapultepec Park, Chapultepec Castle boasts the curious designation of being the only castle in North America that was ever lived in by actual sovereigns. Though the castle itself is pretty in its way (to me, it has quite a modern feel, though construction began in the last 18th century), it’s the views that are the real showstopper. Set at the top of Chapultepec Hill, you can stand on the grounds of the castle and admire the wide swath of green that is Chapultepec Park, plus you’ll get amazing views of the skyline of Mexico City, skyscrapers and all, that rise up beyond the trees. Chapultepec Castle costs 59 pesos ($3.15) to enter. Often touted as the best museum in Mexico City, the Anthropology Museum holds the triple threat of being set in a lovely location (Chapultepec Park), impeccably designed with captivating architecture, and stuffed to the brim with fascinating exhibits. Focused on pre-Columbian civilizations in what is today modern Mexico and the southwest United States, visit the Anthropology Museum to get a taste of what Mexico was like before the Europeans ever arrived. The Anthropology Museum is open from 9am – 7pm every day except Monday. There is a 70 peso ($3.75) entrance fee. Even if you’re not into museums, don’t miss this one. It’s one of the top things to do in Mexico City for good reason. Built in 1910 as a celebration of the centennial of Mexico’s declaration of independence from Spain, the golden independence angel is one of the most recognized symbols in Mexico City. You can visit the angel for an up close look on Paseo de la Reforma (the statue is placed on a roundabout in the middle of the street), but you can also catch a glimpse from the veranda of Chapultepec Castle and admire it from above. ☞ Are you planning to visit other places on your Mexico travels? 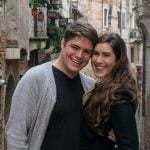 Check out our articles: Things To Do in Cancun (including ideas for things to do away from the beach), Things To Do in Playa del Carmen, Things To Do in Cozumel – Mexico’s Top Island and Things To Do in Tulum. Also, have a look at the awesome things to do in Puerto Vallarta, La Paz, Cabo San Lucas and San Cristobal de las Casas. Unapologetically touristy and over-the-top amusing, Xochimilco is covered in canals that serve one main purpose today: carting drinking tourists around in colorful boats while they let loose and have an excellent time. Hire a boat, pack a cooler of snacks and drinks or just pick some up on the way. Be warned that the vendors onsite will charge predictably high prices given the area’s tourist status. Grab some friends, and you’ll be able to kick back and have a delightful time in Xochimilco. You can reach Xochimilco via public transportation by taking the Tren Ligero, which run all the way to Xochimilco. The Tren Ligero can be picked up at the end of the Blue Line 2, at the Tasqueña station. A ride up and down the river on a shared boat runs about 40 pesos ($2.14) per person, or you can rent an entire boat with a group for about 350 pesos ($18.70) /hour. You can also join a tour, which takes in other sights of the city, plus the Xochimilco boat ride. Focusing almost entirely on European and Central American art, the Soumaya Museum in Mexico City is distinct for a few reasons: its impressive 66,000 piece collection was donated entirely by one man (Carlos Slim), the building itself is bizarre and worthy of photographing, and admission is always free. Though it is home to Mexico’s premier fine arts collection and regularly hosts operas and theatre performances, the Palacio de Bellas Artes is primarily known for one thing: the building’s impressive and beautiful facade. Though we highly recommend stepping inside and admiring the art, definitely plan on being distracted on the palace’s exterior for a bit. 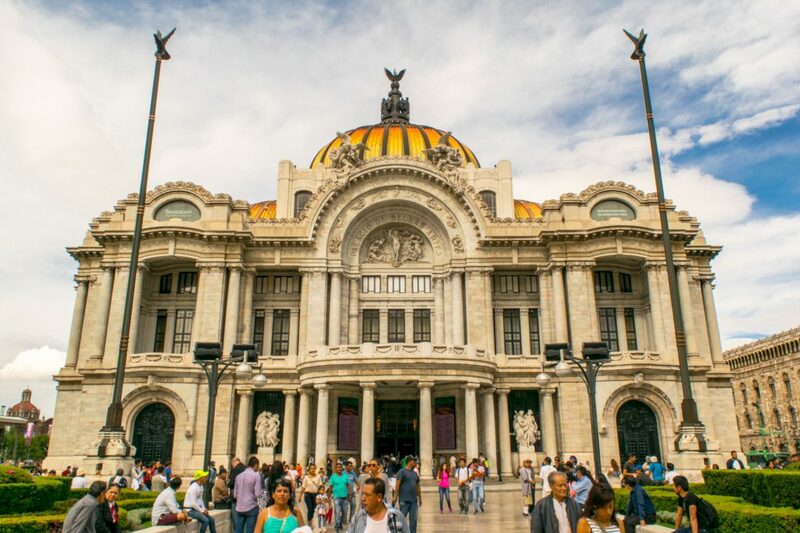 The Palacio de Bellas Artes is open from 10am – 6pm every day except for Monday, and it costs 60 pesos to enter. Located right next door to the Palacio de Bellas Artes, Alameda Central is a beautiful, shaded park, perfect for walking around or resting on a bench in the shade. Alameda Central is impeccably and purposely laid out, and as it was founded in 1592, also boasts the distinction of being the oldest public park in the Americas! The observation deck of Torre Latinoamericana is home to the best view of Mexico City. It’s on top of this tower that we were first able to fully appreciate the sheer size of the sprawl that makes up Mexico City. Definitely make sure you add this to your list of things to do in Mexico City – even with only a few days in Mexico City, it’s a must-do while you’re there. The Torre Latinoamericana is open every day from 9am – 10pm, and costs 70 pesos ($3.75) to enter. Built as a palace in the 18th-century, today the House of Tiles is a restaurant and is known for its facade that is covered entirely in tiles from Puebla on three sides. Blue and white and beautiful to photograph, the House of Tiles is worth a stop whether or not you plan to eat there. The exterior alone (plus its close proximity to the Torre Latinoamericana) is enough of a reason to visit. No trip to Mexico City would be complete without plenty of street food. And, if you’re backpacking Mexico on a budget, you’ll definitely eat your fair share of it – which is a good thing! 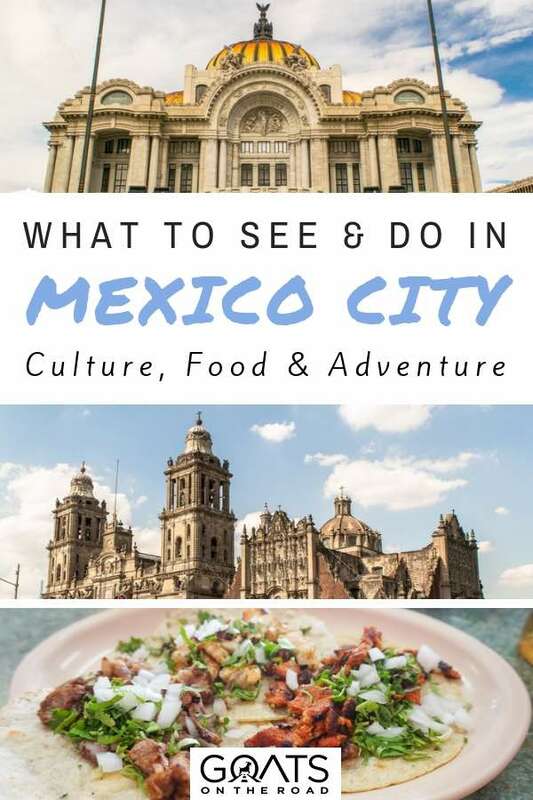 Mexico City is known for its vibrant street food scene, and you’ll find everything from freshly fried potato chips to tamales available from tiny stalls that will beckon you with each sizzle of the stove top. Our personal favourite street food in Mexico City was tacos al pastor. Made of meat similar to a Turkish kebab or Greek gyro (tacos al pastor were actually invented by Lebanese immigrants to Mexico that brought shawarma with them), these inexpensive and delicious tacos are typically served up on corn tortillas and topped with chopped red onions and lime juice. 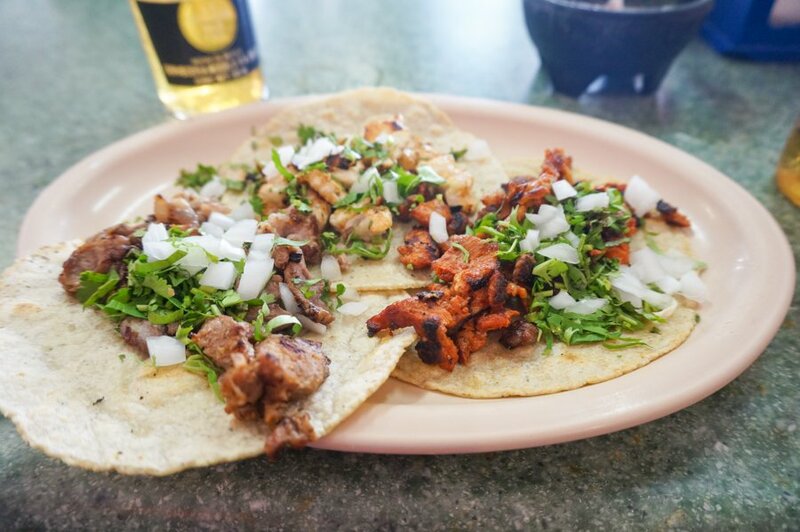 Sampling the local food is definitely one of the best things to do in Mexico City. If you’d rather head out on a food tour with a local, click here. Or, click the image below. If you’re looking for trendy cafes and cups of coffee galore, you need to add visiting Roma & Condesa to your list of things to do in Mexico City (in fact, you might even want to pick a hotel that is in that area). These neighborhoods are known for their hipster vibe, plethora of cafes, tree-lined streets, and excellent coffee. 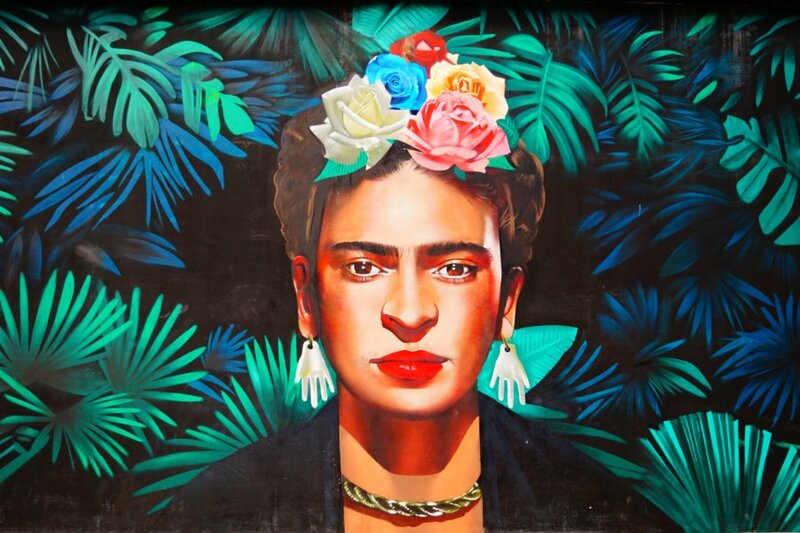 If you’re a fan of the history of Frida Kahlo or her husband Diego Rivera, don’t miss a visit to the Frida Kahlo house while you’re in Mexico City! Also known as “The Blue House”, the home tells the story of Frida Kahlo (she lived here most of her life, including her childhood), and though not much of her art is on display here, her history is. Just a short walk away from Frida Kahlo’s house sits the former home of Leon Trotsky, where he both lived, was assassinated, and where his ashes (along with those of his wife) are now interred. Though the house-turned-museum is small, it provides a look inside the personal life of Leon Trotsky. Looking for a market experience that goes beyond fruits, vegetables, and souvenirs? Head to the Mercado de Sonora – also known as the witchcraft market. While typical wares are available here, so are all manner of goods associated with spells and rituals intended to alter your world through witchcraft. Several religions are represented in the market, including Voodoo. One part bookstore, one part cafe, Cafebreria el Pendulo is a must-see for book lovers visiting Mexico City. Decorated with living plants, the shop manages to feel pristine, modern, and also a little bit wild all at the same time. Come to enjoy a cup of coffee, read a book, or both. This is one of the more relaxed things to do in Mexico City. After all the street food you have (hopefully) been consuming in Mexico City, definitely consider mixing it up and going in the opposite direction for dinner one night. 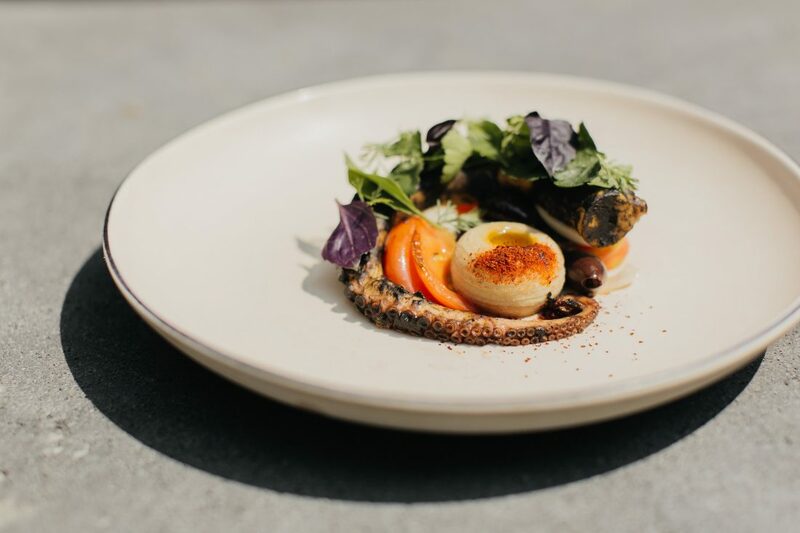 Pujol is Mexico City’s only restaurant to boast a Michelin Star, and though it’s not inexpensive by Mexico City standards, it’s regularly touted as one of the most affordable Michelin Star restaurants in the world. Mexico City’s Palacio Postal (also known as its Main Post Office) is known for a few things: its incredible beauty, its unique architecture, and the fact that – even through a couple of sizable earthquakes – it has operated continuously for more than 100 years. Step inside to fully appreciate the pedestrian, everyday business of a post office set against a gilded, golden interior that seems like it would be better suited for a palace than for something as mundane as sorting mail. Ready to Enjoy The Top Things To Do in Mexico City?! As you can see, Mexico City is a place you could spend a while…there’s just something about the exciting vibe here that will have you coming back for more. Although a bit intimidating at first due to its size, you’ll soon realize that the city is actually quite manageable. With fantastic dining options, wonderful architecture, ancient sites and a vibrant atmosphere, give yourself at least 5 days to enjoy all that Mexico City has to offer. Kate is busy traveling the world with her husband and documenting all the adventures on her blog, Our Escape Clause. When she’s not writing, you can normally find her on a hike somewhere gorgeous, swimming in a beautiful sea, wandering around a city, or planning one of the next thousand trips she plans to take. Awesome tips as usual! Would’ve loved to see some elotes as well! Great article and information. Mexico city always seemed so intimidating t me, but I may have to overcome my fears to see these great destinations!